How do I Fix Achilles Tendonopathy? There are many conservative treatment options available to fix Achilles Tendonopathy which is also referred to as Achilles Tendonosis. 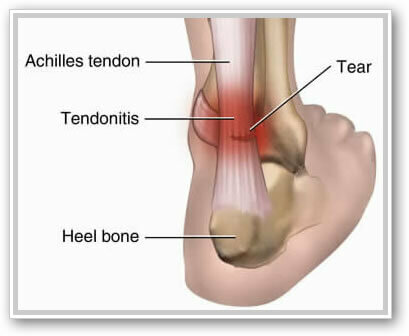 It is important to understand that Ahcilles Tendonopathy and Achilles Tendonitis are not the same. It is the repetitive aggravation in the early stages that causes tendonitis. Repetitive bouts of inflammation lead to Achilles Tendonopathy. Once the tendon becomes pathological = Tendonopathy you are left with a damaged tendon that has suffered repetitive microtears and is now dysfunctional and painful. It is critical to have an accurate diagnosis so that you can choose the correct treatments to fix your Achilles Tendonopathy. Some conditions that Achilles Tendonopathy can be confused with are Achilles Bursitis, Achilles tendon tears, Achilles Entheseopathy and Haglund’s Deformity. If caught and treated early Achilles Tendonopathy will usually resolve with inexpensive, simple but effective treatments. To fix your Achilles Tendonopathy remove the variable that is either causing your Achilles pain or contributing to it. For example; if running is irritating it and you keep running it will worsen and can lead to permanent damage Achilles Tendon. Running and jumping are the most common irritating factors that must be removed. Rest from activity, especially those activities that require running, jumping, walking or any other weight bearing activity. If you are on your feet at work and this aggravates your Achilles it may be necessary to take time off or request a modified job position until you heal. No amount of ice or Ibuprofen will help if you continue aggravating your Achilles. Rest is the second step in how you fix Achilles Tendonopathy. Will Crutches to Fix my Achilles Tendonopathy? It may be necessary to be non-weight bearing to fix your Achilles (but not typical). This will usually be dictated by the severity. Crutches are cheap and effective. Other methods include wheelchairs, knee scooters and Peg-Legs. Can I use a Walking Boot instead to fix my Achilles Tendonopathy? Instead of crutches a walking boot that has a stiff soled rocker bottom might be your best option. There are many types and varieties of walking boots but the variable that makes them effective in treating Achilles Tendonopathy is a stiff soled, rocker bottom which prevents loading of the Heel region. I have found the addition of a Heel Lift dramatically improves the comfort of the boot. 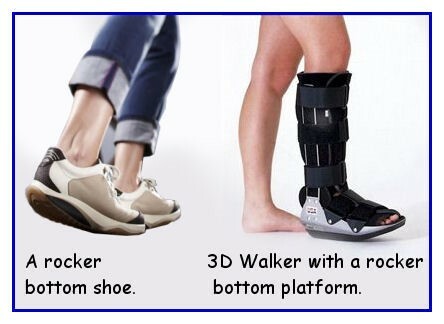 As your Achilles improves it might be possible to transition to a rocker bottom walking or running shoe. This is the third step in how to fix your Achilles Tendonopathy. Can I buy Over the Counter Orthotics to fix my Achilles Tendonopathy? Over the counter orthotics are a cheap but usually ineffective method to fix Achilles Tendonopathy. If the over the counter orthotic is going to have a chance at being effective it must have a large heel to toe ratio such as a high heeled shoe would have. If the orthotic irritates the Achilles you will not be able to improve. Finding the right orthotic with a large heel to toe ration that is both comfortable, effective and is the fourth step in how to fix Heel Spurs. 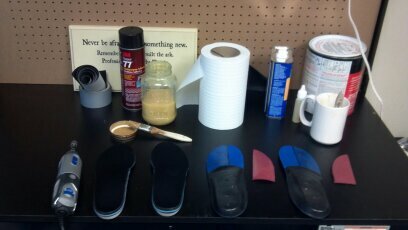 If this step fails you should consider the next step, custom orthotics. If you have tried orthotics in the past and they were painful they were most likely too hard, too high or not manufactured properly,. San Diego Running Institute can modify your current uncomfortable and ineffective over-the-counter orthotics making them effective. Can Custom Orthotics Fix my Achilles Tendonopathy? Custom orthotics can be an effective in fixing Achilles Tendonopathy. 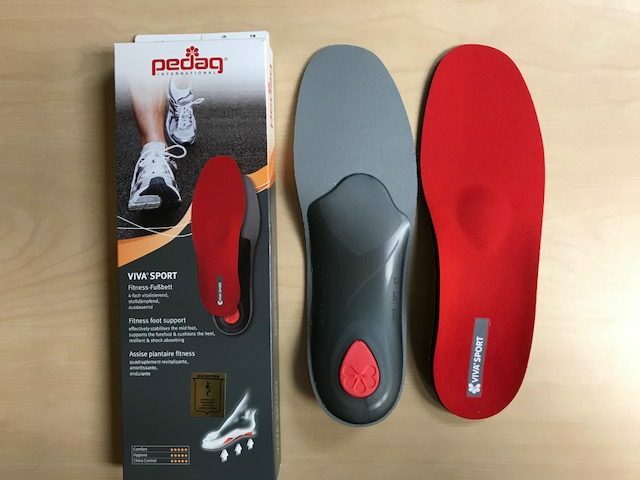 In order to be effective, they must fit into your shoes, be comfortable and have a large heel to toe ratio as part of the custom orthotic design. Proper height, size, density and location of the heel lift is critical to it being effective. If you have custom orthotics that are uncomfortable, do not fit into your shoes or aggravate your heel region you will be unable to improve. If you have an uncomfortable or ineffective pair of custom orthotics either without a heel lift or that is uncomfortable they may be able to be modified for a fraction of the cost off new custom orthotics. San Diego Running Institute charges $167 to modify your existing orthotics and make them both comfortable and effective. Custom orthotics are the fifth step in how to fix Achilles Tendonopathy. How does a Heel Lift fix my Achilles Tendonopathy? A heel lift can transfer pressure from the Achilles tendon to the forefoot. In some instances this is enough to shift the load and allow the Achilles to heal. At worst it is a good idea as part of the overall treatment strategy for Achilles Tendonopathy. If you have an existing pair of orthotics a heel lift can be added to the design instead of spending a lot of money for a new pair. You should have heel lifts placed on both sides in order to be symmetrical. 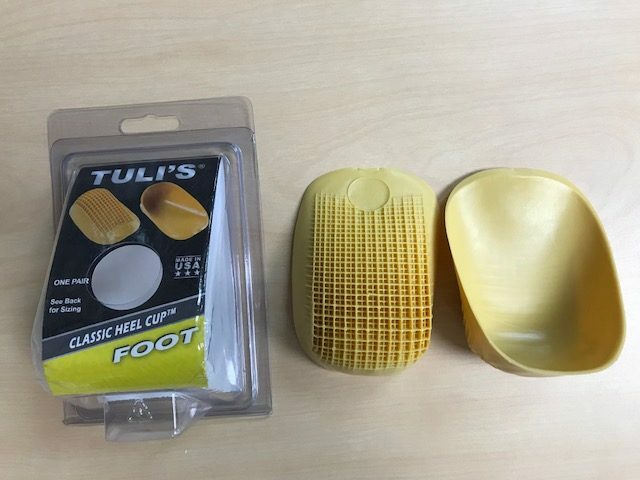 You want a professional to modify your existing insoles and make a proper heel lift. San Diego Running Institute can help you choose the correct orthotic and place the heel lift in the precise location. Modifying an existing orthotic and placing a heel lift can be either the fourth, fifth or sixth step in how to fix your Achilles pain. If you do not have custom orthotics San Diego Running Institute can make you a pair within a week from the time of molding. Can Taping Fix my Achilles Tendonopathy? There are a lot of websites and Youtube videos out there professing to fix Achilles with KT Tape, Rocktape or Kinesiotape to name a few. 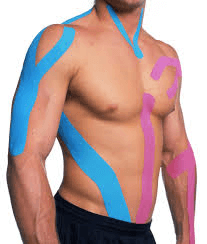 While taping might be part of the overall treatment plan it is not typically going to solve the problem independently. Ultrasound can be an effective treatment for Achilles Tendonopathy when combined with some or all the above interventions. Ultrasound can be used to break up scar tissue and increase blood flow into the Achilles Tendon. The Achilles Tendon is notorious for having a lack of blood flow. Blood is required for the Achilles Tendon to heal. When other conservative methods have failed Ultrasound treatments are your next step in how to fix your Achilles Tendonopathy. At San Diego Running Institute we routinely employ ultrasound to fix Achilles Tendonopathy. The AlterG is one of the most modern and effective treatments for Achilles Tendonopathy and allows the patient to run or walk while their Achilles is improving. 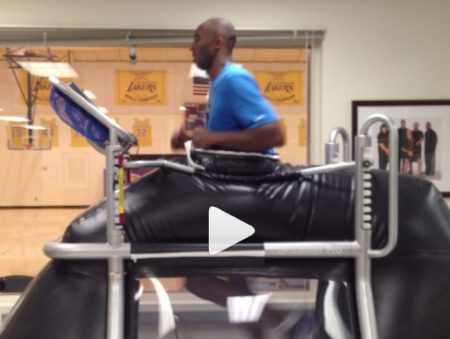 The AlterG does this by “unweighting” a person until there is not enough pressure on the Achilles to cause pain. Once this is achieved the patient can run or walk without aggravating their Achilles. This allows them to keep up their cardio, continue to train for an event and stimulates blood flow into the Achilles Tendon to speed healing. The AlterG has become one of San Diego Running Institute’s best interventions in fixing Achilles Tendonopathy. Will Cortisone Injections Fix Achilles Tendonopathy? Cortisone is not normally recommended for Achilles conditions. Cortisone is a catabolic hormone meaning it breaks things down (as opposed to an anabolic hormone that builds tissue). While it does break down inflammation it also breaks down tissue, in this case your Achilles Tendon. This can cause long term damage to the Achilles Tendon and is therefore not recommended. However, there are some instances when we will recommend one well placed cortisone injection to interrupt Achilles Bursitis. It is crucial that you do not exercise (with your feet) for 2 weeks following a cortisone injection into the Achilles region. not recommended to fix my Achilles Tendonopathy. 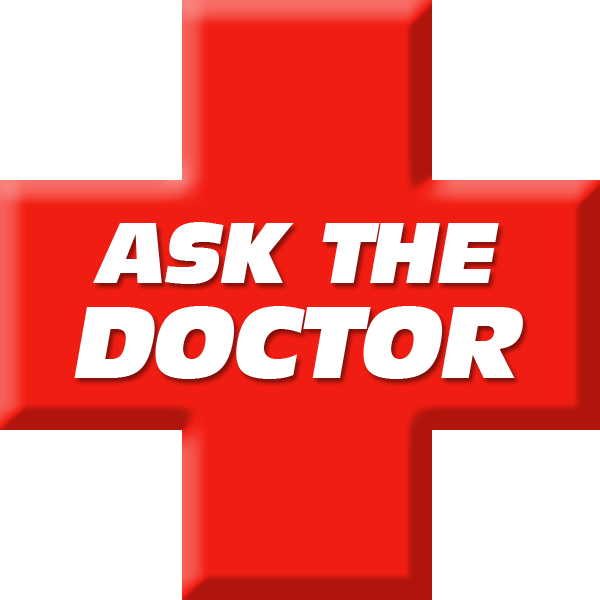 Do I need Surgery to Fix Achilles Tendonopathy? Surgery is not usually necessary in order to fix Achilles Tendonopathy. However, if you go to a surgeon and they recommend surgery……. what did you expect. Your Heel structures (Achilles Tendon, Plantar Fascia, Calcaneus, Medial Calcaneal Nerve), if treated conservatively will almost always heal and not require surgery.